SEE what Beyonce bought during her London shopping spree! SEE what Beyonce bought in London! The superstar hit Harvey Nichols to indulge in a spot of retail therapy, and we know precisely what she purchased! Beyonce Knowles indulged in a spot of retail therapy at Harvey Nichols over the weekend, and check out her impressive shopping list! While performing the London dates of her sell-out I Am…world tour, the megastar decided to check out our capital city to see what the shops had to offer. Having already been spotted in an assortment of outfits from the British high street – including a £20 New Look dress – Beyonce went on an extensive £6,000 spree in the Knightsbridge department store. 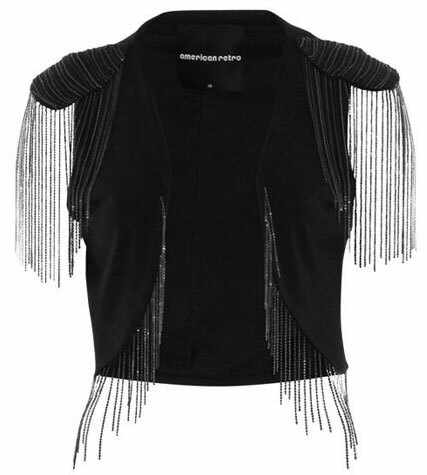 Our Harvey Nichols insider tells us that top of Bey’s list was this covetable American Retro Chain-Trim gillet, £205 – which is pretty Sasha Fierce if you ask us. The world-famous diva also bought a pair of large black Ray Ban Wayfarers, a vintage jacket from denim brand 13R, and a couple of pieces by designer du jour Alexander Wang. According to our source, she seemed particularly taken with Jade Jagger’s collection, Jezebel – taking home the scoop-neck Lady Print dress, as well as this Lazer tank, £50, and Flouro Heart tee, £55. Rounding off the tiring spend-up, Miss Knowles also selected items from brands including Matthew Williamson, Marc by Marc Jacobs, Missoni and Juicy Couture. A girl after our own hearts! READ: SPOTTED! BEYONCE WEARS £20 NEW LOOK DRESS! CHECK OUT OUR GET THE LOOK GALLERY FOR MORE STYLISH BUYS AS WORN BY YOUR FAVOURITE CELEBS!